In my work as a gardener I have tended numerous private gardens, and each time I go to a new one, I can pretty much predict which plants I will find before I even arrive. The same plants are there, time and time again. These are the plants that are sold in their thousands by the large scale garden centres, DIY stores and even supermarkets. Yes, they may be pretty, cheap to propagate and easy to grow, but surely variety is the spice of life! The UK has a long and proud history of horticultural diversity that is swiftly being lost to this small selection of mass produced plants. My own garden at home is only small, but even friends and family with little interest in gardening notice how ‘different’ it looks. This is simply because I seek out more unusual plants that really make a statement. We grow some of the more common classics too, but amongst them there are plants with different shapes, different textures and different colours. There are so many exciting and new plants to discover if you know where to find them! The internet provides a home to all sorts of specialist nurseries. These are not run by entrepreneurs that are in it purely for a business opportunity; they are true plantsmen and women who are knowledgeable, passionate and have a real love for plants. 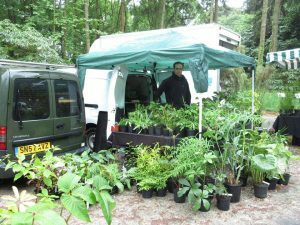 I recently had the privilege of selling my plants at the Tregrehan Rare Plant Fair. Not only was it great to have a stall, it was a fantastic opportunity to meet up with other specialist horticulturalists and to seek out new and interesting plants from among the tables of rarities. This was the third year that I’ve been invited to attend, and on each occasion, I’ve been introduced to new and inspiring plants. There is still so much to discover! Along with two other top quality rare plant nurseries, I was featured in the Daily Telegraph in an article about the Tregrehan Rare Plant Fair. Why not take a look at the selection of unusual plants in our shop? Go on, be adventurous and grow something different! In doing so, you can help support the UK’s long and proud heritage of horticultural diversity.